The Tilt Image Divi Module is a customised Divi Image Module with a cool lightweight jquery tilt effect. The tilt effect works on hover. As you hover over the image with your mouse cursor the image will appear to tilt. The position off the mouse cursor determines the tilt direction and amount. The module includes all the settings of the standard Divi Image Module and adds settings to adjust the tilt effect in a number of ways to allow you to create some unique effects for your images. You can adjust the Tilt Amount, the Tilt Perspective, Tilt Speed, Tilt Scale and Tilt Glare. You can also add a Tilt Shadow and Reverse the direction of the Tilt Effect. The jQuery script used is called ‘vanilla tilt’ which is a forked version of tilt.js. It’s a very lightweight script that weighs in at just 4.5kb. Please Note: You will require the Divi WordPress Theme or the Divi Builder to use this plugin. Install and activate the plugin like any other WordPress Plugin. 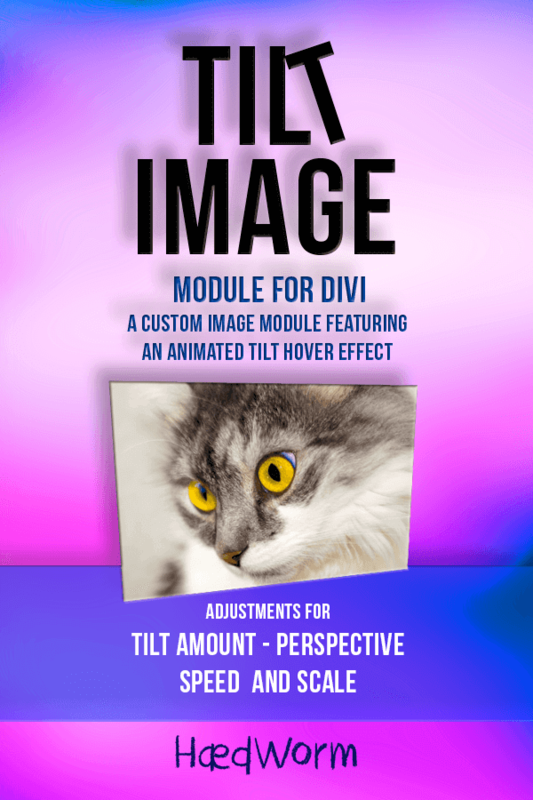 Once installed and activated the Tilt Image Module will be available along with the Divi Modules for the standard and speciality sections when you click the Insert Module(s) button in the Divi Builder. Add the Tilt Image Module to your layout. To enable and adjust the Tilt Effect click the Tilt Settings Tab and then click the ‘Use Tilt Effect‘ Toggle switch to the ‘on‘ position and adjust the settings accordingly.